Hello my friends, we are already in the fourth week of Lent, and I have been waiting for the longest time to publish this insanely delicious custard dessert recipe: a Traditional Swiss Easter Rice Tart. This dessert is very popular in Switzerland as “gâteau de Pâquesrt,” and it’s only served during Easter Week. In my house, this tart will be served any time of the year! I found this recipe in the NYT Cooking section. 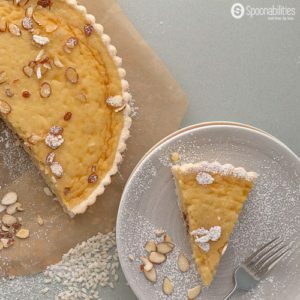 This traditional Swiss dessert is a custard tart, with rice, lemon, and almonds in the filling. I made it extra special with my personal additions like evaporate milk, amaretto liquor & raisins. Holding this wonderful custard filling is a sweet pastry crust. The critical step that will help you to reach the right texture for the filling is to cook the rice extra soft. This will help you get a creamier consistency and better result when you go to puree the mixture. Additional ingredients like ground almonds, amaretto liquor, raisin and citrusy lemon zest add a taste of decadence to this rice pudding custard-style pastry. This Traditional Swiss Easter Rice Tart Recipe is my new obsession because it has the best of my favorite dessert flavors: custard and rice pudding. Dominican Republic Traditions during Holy Week! Like I said in the beginning, this week is the fourth week of Lent, or how we call in Spanish, Cuaresma. As a Latin country, the Dominican Republic is very Catholic and follows strong traditions during the period of Lent with several religious services and practices. Most of the traditions are shared worldwide in the Catholic faith, like Ash Wednesday as the first day of Lent – the beginning of this religious period, forty days of fasting, Domingo De Ramos – Palm Sunday, Christ’s passion and death, and His resurrection on Easter Sunday. During Holy Week (Semana Santa) in my country, some companies and all schools are closed for the whole week. Others start to close on Wednesday. Something that I found very shocking when I arrived in the USA is that Holy Week is “nothing important,” here. You don’t even notice Easter is coming except for the commercial side with all the bunnies and chocolates and jelly beans for the kids. The time of Holy Week and Easter is a national holiday in DR. The local tradition is to go to church almost every day because there are different services related to Jesus’s last days with us. Another different tradition, for example, is on Good Friday the TV and radio stations don’t play loud music or Merengue (our traditional music). We don’t eat red meat or chicken – only fish – and some people fast completely. After all those activities, on Easter Sunday we eat A LOT of desserts!! In addition to the strict Catholic traditions of the last days of Lent, there are some more relaxed, but just as religiously followed traditions. Starting the Wednesday of Holy Week, the streets are empty until Sunday. The streets are empty not because everyone is in the church. It’s also a national tradition in Dominican to take time off from work and go visit with friends and family. People share time together in resorts, mountains or any relaxing and fun place to escape from the daily routine. I preferred to stay at home eating all the yummy desserts made by my mother and grandmother. Plus, every neighbor as they finish making their own desserts, share their dishes with all the families in the neighborhood. You can imagine how many pounds I gained by the end of the week. You can see that desserts and pastries are no stranger to me during Easter time. So, I have been waiting and waiting to make and share this Traditional Swiss Easter Rice Tart Recipe with all of you. I hope that you enjoy it as much as I enjoyed making, photographing, and eating it. Enjoy! Traditional Swiss Easter Rice Tart Recipe has a custard type filling with rice pudding, citrusy lemon, ground almond and a crunchy, sweet tart crust. This custard tart, traditionally only served during Easter in Switzerland, has the additional flavor enhancers of amaretto liquor and raisins which pairs perfectly with the citrus. Whole Milk - I used evaporate milk & skim milk. Combine 1 1/2 cups flour, 1 TableSpoon sugar, 1/2 teaSpoon salt and the baking powder in food processor. Pulse to blend. Add 10 TableSpoons butter and pulse 3 to 4 times, until butter is in pea-size pieces. Sprinkle in 3 TableSpoons cold water. Pulse 4 times. Dough will not come together. Turn dough out on lightly floured work surface and knead gently a few times to form a disk. Wrap in plastic and refrigerate at least 1 hour. In a small bowl add 1/2 cup amaretto liqueur & 1/2 cup raisins. Let the raisins soak until you are ready to add to the rice pudding custard. Meanwhile, half fill a 3-quart saucepan with 1½ cups water, bring to a boil. Stir in rice, lower heat to medium and cook until rice is soft - about 15 minutes or longer until the water almost evaporates completely. Add evaporated milk & skim milk, 1 TableSpoon butter, 1/2 cup sugar and ½ teaSpoon salt. Bring to a quick boil. Reduce heat to low and add the amaretto liqueur. Leave the raisin aside. Simmer until mixture has thickened almost to a risotto consistency, about 20 minutes. Place saucepan in a large bowl of ice water for 10 minutes to cool mixture. When cooled, purée mixture in food processor. Then pour into a bowl and add lemon zest and raisins. Mix ground almonds with 1 TableSpoon flour and add to bowl. Stir in eggs one at a time. Place oven rack in lowest position and preheat oven to 350 degrees. Remove pastry from refrigerator and place on lightly floured surface. Lightly dust top with flour. Use a rolling pin to press down on dough to soften it. Roll out disk to 12 inches in diameter. 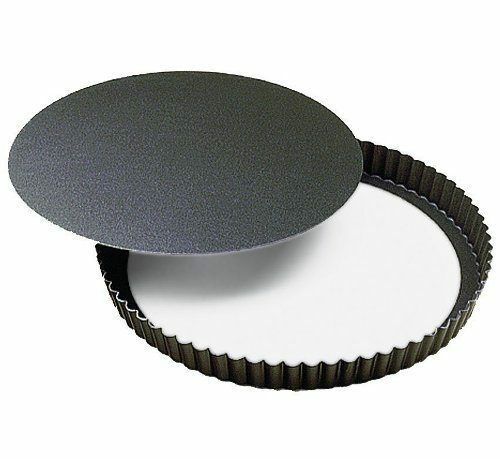 Transfer to a 10-inch tart pan with a removable bottom. Press dough evenly into pan. Trim edges flush with pan. Pour filling into pastry dough. Bake about 35 minutes, until filling is set and golden. Cool on a rack. Dust with sifted confectioners’ sugar before serving. Wow! Beautiful. Can’t wait to try this one. This is just beautiful. 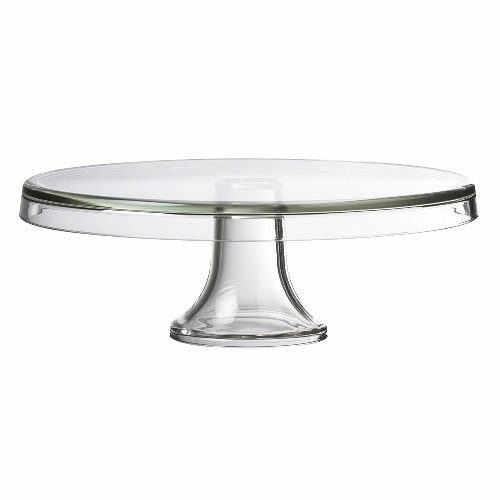 Perfect for brunch! I don’t think I’ve ever had a rice tart before, but this sounds quite delicious! Hello Lisa, You definitely should try it. It is super easy, even the crust! I’ve never heard of this treat before, but it looks delicious! I love anything rice pudding-y and the almonds sound like a delicious addition! Raia, every ingredient work their magic for a super delicious dessert. Thank you for your comment! Such an intriguing recipe! 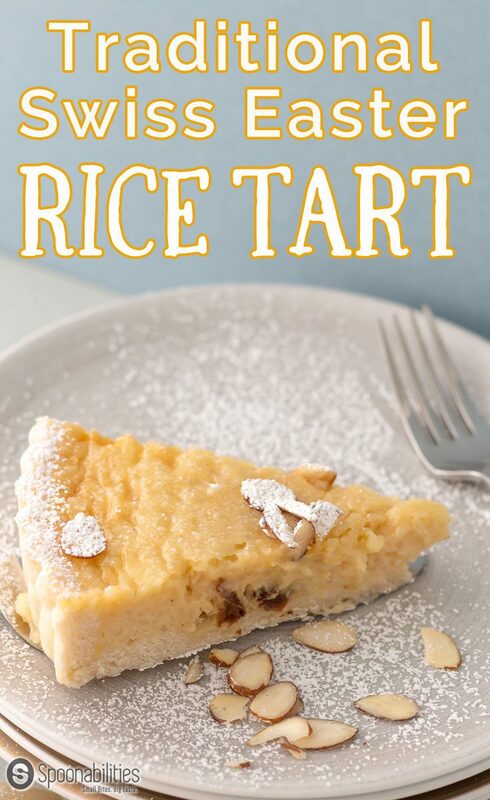 I’d never have thought to put rice in a tart, but I can totally see how this would work! Yum! Elizabeth – You should try, and it won’t disappoint you! Thank you! I’ve never heard of a rice tart before, but this looks so good! Michelle, You will be surprised how delicious, creamy an crunchy is this tart. How delicious! I love the almonds on top and how creamy it looks. Thanks Patty. Glad to have you on board! We never heard of it before finding it a couple months ago. Carlos LOVES custard and pudding so it was a no-brainer. Enjoy! This tart looks gorgeous and perfect for Easter. Such gorgeous clicks there ! Never tried rice tart but this one looks awesome. This looks delicious! I love the texture of this and it looks so moist! Yummy! I may have to add this to my Easter spread. Luci’s Morsels | fashion. food. frivolity. Such an interesting post about traditions, religion and customs. The rice pudding topping on the tart looks absolutely scrumptious! Hi Mel, I love to make connections between the food and traditions. It’s my way to understand and enjoy the rich culture from the different countries. This is so interesting, I have never seen rice used in desserts before. I’ve heard of rice pudding but never actually seen or tried it. This looks amazing! Tina, you should try asap rice pudding. Rice pudding is my all-time favorite dessert. It’s magical, creamy & very filling. I have a recipe on the blog with rice pudding. Check it out..
Never heard of this, reminds me of rice pudding pie! And I like your addition of amaretto! Rice pudding pie? Do you have this recipe? I would love to try it. I like to add a touch of liqueur to my desserts. Take the dessert to another dimension. I love recipes that come with traditions and fun history! Thank you for sharing! You’re welcome Julian -I’m a big fan of history and traditions. Every time I have to chance to share I like to do it. Oh my what a wonderful sounding recipe, the filling is very similar to an old fashioned British rice pudding. Which I incidentally switched from a long grain rice to short grain many years ago 😀 Gotta give this a try. Hi Brian, Thank you so much for your comment. Do you mind to share your recipe with me of the old fashioned British rice pudding? This sounds like something my husband would love, and his birthday is right before Easter this year. However, he hates raisins. I’m assuming I can just leave that out of the recipe completely? It won’t change the way it bakes? This looks and sounds delicious!! Can’t wait to try this! Please do Sarah. Let us know what you think. Looks yummy! My husband is Swiss and we spend a lot of time in Switzerland, but I’ve never heard of this dessert. Can’t wait to try it! Thank you Marlynn. We are excited to hear what your husband as to say about it. Do let us know if our information is correct or if it’s called by another name. Enjoy! LOL Morgan. I have had a few of those promises before. I’m so glad we squeezed on to your list! Have a happy Easter! This is so creative. I have never tried something like this before. This is a good idea and amazing recipe too. Need to try it out. Hi Mary. Please do. Let us know what you think about the recipe and the tart. So awesome to find out more about the Swiss cuisine. And the reflections in the second photo are incredible! Love everything about this recipe. Thank you Elaine for mentioning the reflections. I don’t think that was intentional when Carlos took the photos, and looking at it now it IS pretty cool. What a gorgeous pie, I love the addition of amaretto in this too. It is so lovely to hear about the Easter traditions in the Dominican Republic as well. Thank you Michelle for mentioning the amaretto. It’s a nice touch we think. So glad you love hearing about Carlos’s Easter traditions in the DR. I certainly love eating the benefits of them.